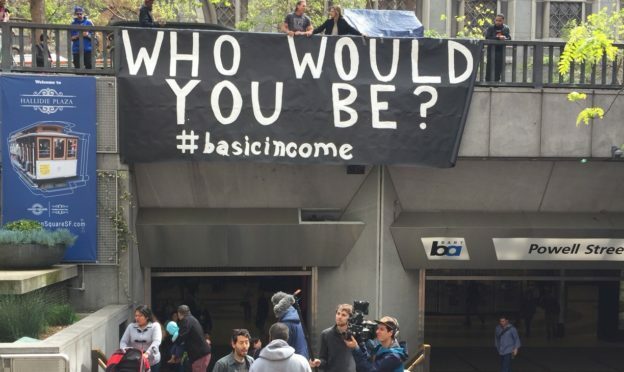 From March 24-26th, the Universal Income Project hosted a Basic Income Create-a-thon. This is a dedicated time for artists, activists, coders, writers, politicians and many more to work on projects that advance the basic income movement. Projects ranged from a giant sign hung outside a busy train station to a software platform that allows small groups to establish their own basic income. This entry was posted in and tagged basic income, basic income poster, createathon, podcast, san francisco, ubi, universal basic income on March 30, 2017 by owenpoindexter@gmail.com. I’ve written a proposal they I believe resolves most of the criticisms and fears about UBI while maintaining all of the benefits and more. I’m searching for serious people to critique it. I could not find a contract form on your website, so I am posting it here in the hopes that you will read it. It’s a bit of a rambling document, but I feel I need to give the context in order for people to make the join between the two fundamental concepts that I have combined in this proposal. Please comment and let me know if you have any firm criticisms. I’m keen to get further into the weeds but feel that I’ve reached my limits in terms of the nuances without contributions from others.